I stand with the teachers across the city who are advocating for common-sense regulation. 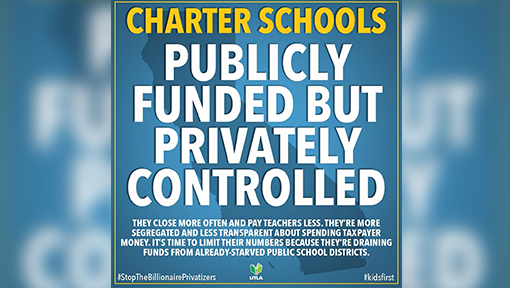 No legislation currently exists in California to regulate the fiscal and educational impact of charter school expansion on existing charter and district schools. Consequently, we see an oversaturation of new schools opening in certain areas, and existing schools suffer underenrollment as a result. Last year, my school, Alliance Middle School #5, laid off four educators due to declining student enrollment. Over the past several years, our enrollment has decreased by approximately 100 students. The impact of declining student enrollment means fewer staff and potential program cuts. At my school, we no longer have the funding for an art teacher. We are no longer able to offer any honors classes. We simply cannot continue to have unregulated growth of new charter schools at the expense of our current schools and students. It is not sustainable for existing district schools or charter schools alike. This lack of oversight is especially irresponsible in the parts of L.A. that are facing gentrification. My school is located in Lincoln Heights, and someof our students’ families are struggling with the harsh realities of housing costs rising substantially. It seems like everyweek we get an email notifying us of another student unenrolling because their family is being displaced, havingto move inland to San Bernardino, Victorville, and even out of state. Between more charter schools being authorized and the impact of gentrification, we are finding it more and more difficult to meet our enrollment capacity with each passing year as the student population in the community declines. As educators, we cannot be dismissive of these critical matters. Whenschool programs get cut or our schoolsclose, it affects students, parents, andour whole community. It was just this school year that a PUC charter school in Eagle Rock closed on the fourth day of school without notice to anyone because of underenrollment. I became a teacher so I can advocate for my students and community, and I stand with the teachers across the city who are advocating for common-sense regulation to address these concerns. Educators across Alliance are coming together to collectively advocate for the best schools for our students and our profession. Through our union, we as educators can affect positive changes to make our schools sustainable and improve our students’ learning conditions at our schools and throughout our community.